Italianate style beach-inspired decor Wi-Fi access and afternoon wine and hors d'oeuvres give guests a warm welcome at the non-smoking West Cliff Inn. 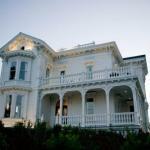 Housed in an 1877 mansion on a bluff across from Cowell's Beach this non-smoking hotel has 10 rooms on two floors with beach-inspired decor marble-tile bathrooms and flat-panel cable TVs; Wi-Fi access is also available. Some rooms include fireplaces and jetted tubs and all rooms are non-smoking. A breakfast buffet is served and as a special treat the hotel offers wine and hors d'oeuvres in the afternoon. Parking is free. Cabrillo Highway is one mile from this hotel. Family fun awaits at Santa Cruz Beach Boardwalk within walking distance. Learn to surf at Cowell's Beach also within walking distance. University of California Santa Cruz is two miles away and it's 35 miles to Norman Y. Mineta San Jose International Airport.